Willful Wellness – Super Foods. Super Me. Something that I am needing to learn more about is how to get enough protein from a variety sources. This is not all about macro nutrients though (e.g. fats, carbs proteins) or even sourcing protein from one type of food like meat. There are ways to combine certain foods like whole grains and legumes to get protein since you are getting the needed amino acids from the two different foods to make protein for your body. There are also foods that have smaller amounts of protein, too like spinach. 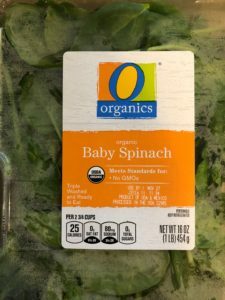 Spinach has .9 grams of protein per cup and broccoli has 2 grams per serving. You get the idea: A little from here and a little from there. What I am figuring out still is how to get enough for my own body from better, low processed sources. For example, I am shooting for a 2,200 calorie day normally. I feel better when I have 100 grams of protein a day. There are 4 calories for every gram of protein so 4 x 100 means 400 of my daily calories should come from protein. It’s a work in progress and I will need to breakdown everything I am eating to make sure I am hitting my protein mark. I definitely do not want to lose muscle mass during this time. Five days in and I have been feeling a bit lighter in body and mind. Sure, there are some benefits that come from just paying more attention to what goes my mouth. Call it “mindfulness” or just a better sense of self-awareness. Even so it is hard to describe except to say my mind feels less distracted and more stable. Switching gears, let’s talk about yummy drinks! I had this tonight. Here is the stuff that goes into a smoothie I call a “Blueberry Kiss”! 2 cups hemp milk, 1 cup blueberries (frozen), 2 tbs cacao and 1/2 tsp maca powder blended well. Over 20 amino acids, including 8 essential amino acids, 20 free-form fatty acids (such as lauric, linolenic, palmitic acid, oleic , and steric acid), vitamins B-1, B-2, B-6, C and E, calcium, magnesium, potassium, copper, zinc, manganese, phosphorus, selenium, sulphur, sodium, iron and dietary fiber. 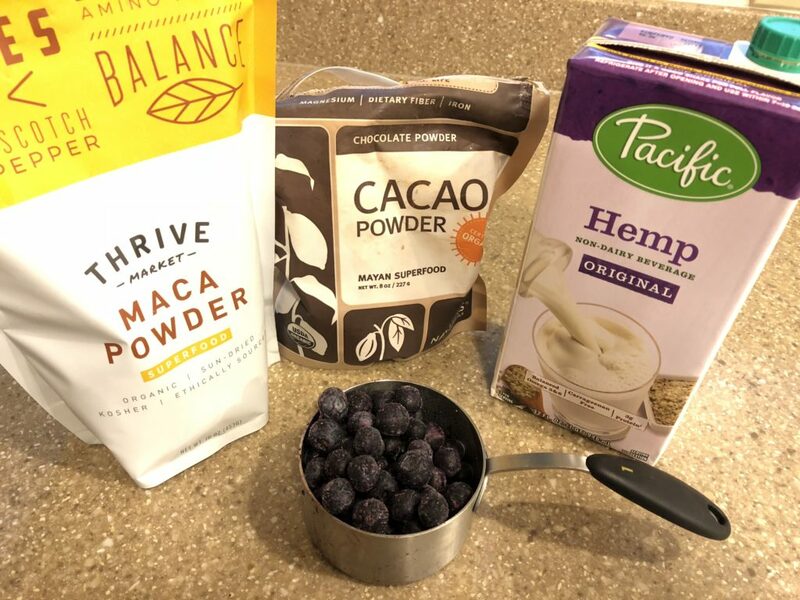 Since it is so processed, I am not sure hemp milk is a super food but maca powder, blueberries and cacao definitely are. Plus, I could have one of these every day. It is that good! Last night the tab at check-out came to $73.67. I was a bit shocked. All my little plastic bags and other items added up. One thing in particular caught my attention. The red quinoa was $11.50 for 1.23 lbs. I know nothing about shopping for this stuff so I was caught off guard. It is great stuff, though. Mainly I am attracted to quinoa for the protein. 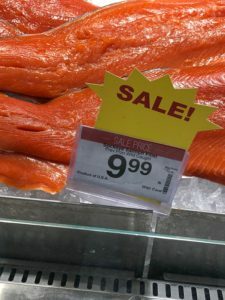 It has the right amount of 9 essential amino acids to make it a complete protein. Many meat eaters think that you cannot get protein without meat but that’s a bunch of…umm…baloney*. All dietary proteins are made out of amino acids and quinoa has it covered. Mind you, a cup of cooked beef has about 31 grams of protein compared to one cup of red quinoa which has 8 grams of protein but there is so much more that quinoa offers. Yes, this grain goes back to the ancient Incas which sounds romantic but does it mean anything? I think it means something because this edible (which is not a grain) has stood the test of time and marketing. Now I just need to find some cool recipes. Not too long ago I was really healthy. I mean "vegetarian working out hard 4-5 days a week with a six pack" healthy. I was about 182 lbs or so. Now, I am about 212. I have a digital scale that is pretty consistent compared to other scales. Except compared to the scale at the doctor's office which always adds 5 pounds. Really. Not that the extra five pounds really matters - I am overweight. More to the point, I have too much body fat. "You are in pretty average condition for an American these days but if this was the 1950's, I would tell you to lose some weight." That really hit me for some reason. I know better or I knew better at one time. I know how to eat and exercise better more than most people. So what happened to get me here and how do I fix it? Knowing better and not doing it wrecks the soul, I think and I wanted to fix that. "How" I will do that is part of the story I want to tell here. I love how ridiculous cliches and trends are. I grew up when not drinking milk was an anathema and meat was the only way to get protein. The trends and angles of social expectation that refract and distort the light of truth come and go but food should be outside that, right? Human physiology hasn't changed all that much for thousands of years. Yet, the food fads creep in. Nothing stands out more for me than the term "super food." It's a basically a meaningless term based on some imagined kernel of truth. 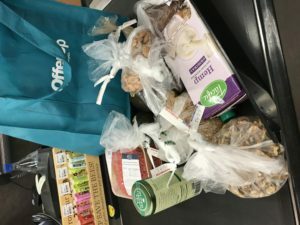 As a learning piece for me and to keep myself interested in eating better, I decided to limit my diet to almost exclusively super foods for 60 days and see what happens. How will my body change? How will my perception of how food is sold and marketed change? What things will I discover about my past and future as I do this? What fallacies await destruction in my mind and which ones do I want to keep? Starting November 1st, 2017 I began this wee journey. I will run it through New Years Day when I plan to also participate in a polar bear plunge to help celebrate the New Year 2018. I plan to go forward and in a lot of different topic directions at the same time. Trust me. Think of the posts to come as spokes of the same wheel rolling along.